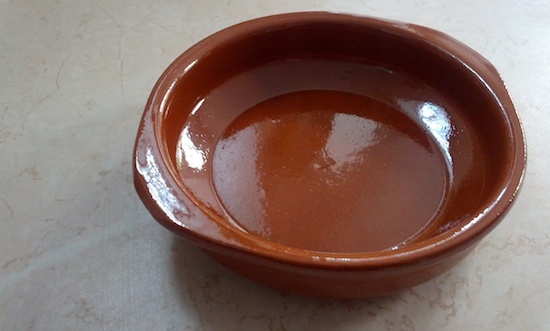 How to store clay dishes? The problem: the clay draws in a lot of moisture when cleaning and they are continually damp. As a consequence, they mould very easily (both on the glazed and the unglazed surfaces). I’m already storing them on an open shelf and stack them shifted to let air enter but that doesn’t prevent the mould. Surely there must be a way to store them safely – after all, they are used quite commonly in some kitchens. The trick is not storage, but washing. These types of dishes soak up loads of water if you dip them in. I wash these types of dishes in an empty sink and then try them right away. I would also never put them into the dishwasher. If they get too damp you need to dry them our, the best way I've found is to warm an oven, turn it off, and then to put the dishes in leaving the door cracked open. The heat will drive the moisture out and the open door will allow the moisture to escape. As for storage a dry cupboard should do just fine. Not the answer you're looking for? Browse other questions tagged storage-method utensils or ask your own question. How to store homemade granola? Is it safe/sensible to store utensils above the hob? How to best store cupcakes? How can I store truffles?